As discussed in my previous post on why one should invest in stock markets?, here I am writing about the most popular investment vehicles in the current markets, Mutual Funds. In the last 2 years, India is seeing a huge surge in importance of financial planning. People are becoming more financially educated and taking utmost interest in managing their finances closely. Mutual funds have truly done well, with money flowing steadily into the funds. You can see the surge of about 23% YoY in the amount of asset under management for the mutual funds in India. This increase in investment in the domestic mutual funds is giving a lot of stability and balance to the Indian capital markets. The dependence of our capital markets (read stock markets) on the foreign institutional investors (FII) is reducing gradually. However, we are still a bit far from FII independence but our journey has begun. Increase in the amount of Indian savings invested in Indian mutual funds will lead to increase in domestic participation in the stock markets, bringing stability and maturity to our stock markets. 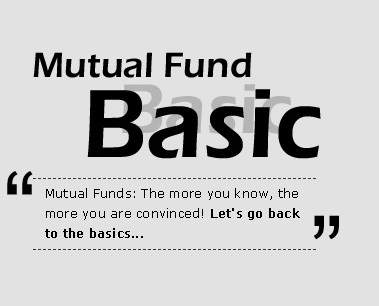 So, let us understand different types of mutual funds. The first classification is based on the method of investment. Whether it is lump sump or it is systematically on a monthly basis. 1. Systematic Investment Plan – Popularly known as SIP, this is the most preferred plan as here one decides to invest a set amount on a monthly basis. 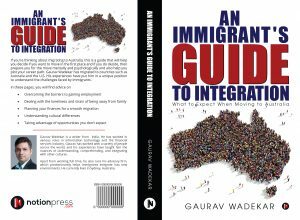 This is a disciplined way of investing and most people reap long term benefits from these plans. One also gets the benefits of power of compounding through these plans. 1. Equity funds – These are the funds where the major focus is on equity. These funds are suitable for high risk takers who are willing to wait long term. The returns from holding these funds for more than 1 year, are tax free. 2. Balanced funds – These are the funds where there is a balance between equities and debits. The funds are suitable for medium risk takers. 3. Debt funds – These are the funds which invest in government and corporate bonds. These funds are for low risk takers. It is realized that putting one’s money in these funds is better than putting it in fixed deposits. Final classification is based on whether one can hold the fund or has the flexibility to liquidate when required. 1. Open Ended Funds – These are the funds where one can enter and exit at any time. 2. Close ended funds – These are the funds where one can enter only during NFO and has to hold the investment until the fund closing date. These funds are for definite periods. One can exit before the closing date but, there would be significant costs involved. The Fixed Maturity Plans (FMPs) or the Fixed Term Plans (FTPs) fall into this category. 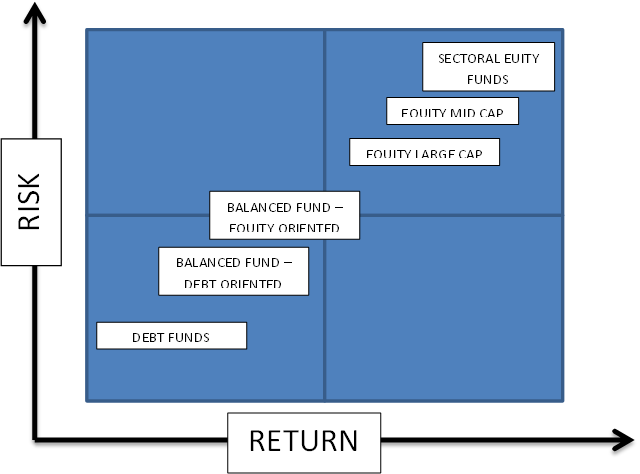 The above chart gives a brief understanding of the risk-return for various kinds of funds. There might be further variations in the fund types but overall this is the pattern which the funds follow. Each type of fund mentioned above is a study in itself. In the coming days, we will look at different examples of each type of fund. This will give you a better idea on what to look for when you go out to buy a mutual fund.